Hi, Karina! I am sooooo excited to celebrate The Vanderbeekers of 141st Street today and throughout the year. 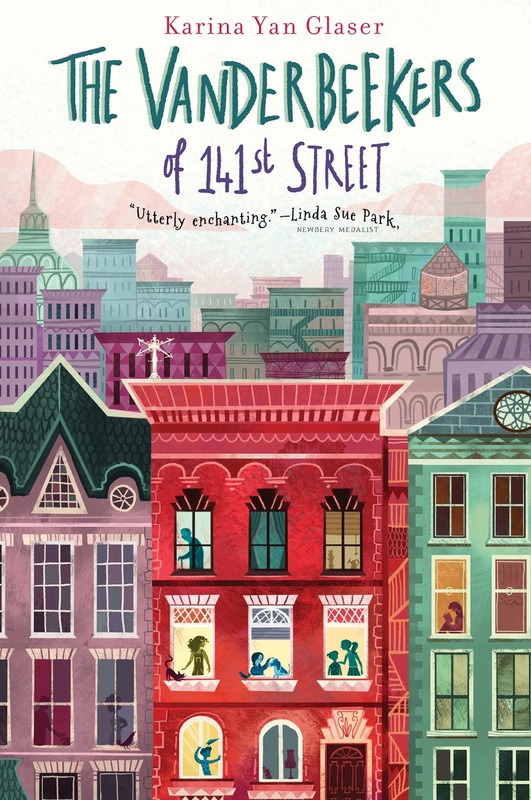 Thank you for finishing my sentences and for allowing me to reveal the cover for The Vanderbeekers of 141st Street. Karina Yan Glaser: Thank you for having me! I’m such a huge fan of your blog and love your enthusiasm for kid’s literature! Thank you for all you do for children's literature. I think Karl James Mountford’s cover illustration is absolutely perfect! I love how he captured the spirit of the Vanderbeeker family, their home, and their neighborhood. 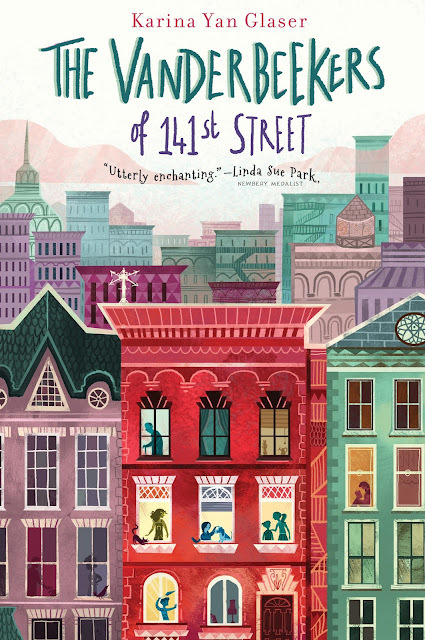 Home and community is such a big part of this story, and the cover captures the life (and secrets) in the brownstone where the Vanderbeekers live. 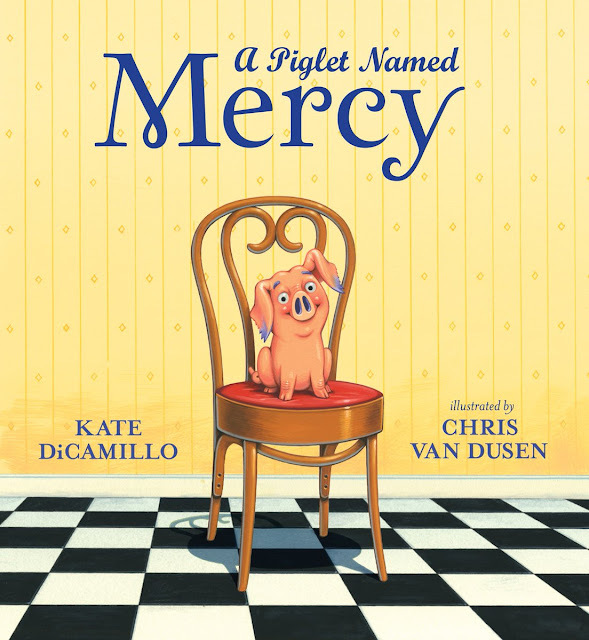 I feel so lucky that HMH chose Karl to do this book cover (and that he said yes)! Isa, Jessie, Oliver, Hyacinth, and Laney are five kids who live in a brownstone in Harlem, New York City. Isa and Jessie are twelve-year-old twins, Oliver is nine, Hyacinth is six, and Laney is four-and-three-quarters. I love big family dynamics, and my favorite scenes to write are when the five of them are in a room together and are all talking over each other. On October 3, 2017, The Vanderbeekers of 141st Street will be out in the world! I will probably go to a bookstore, which is what I do whenever there is a reason to celebrate! 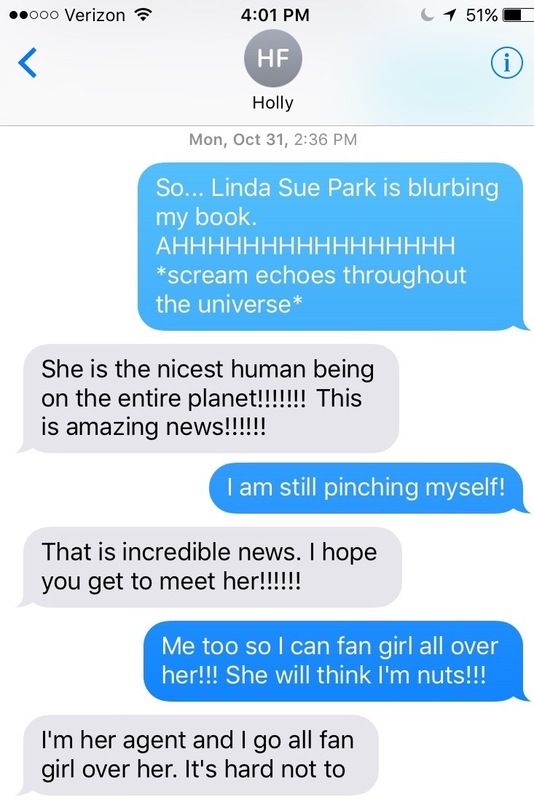 Linda Sue Park is my author hero! I’ve admired her forever and read all her books. When my editor emailed me with Linda Sue’s blurb, I was in complete shock. I could not even believe that Linda Sue Park read my book… and she liked it! Linda Sue is represented by the same literary agency as I am, so I immediately texted the film agent there (who also happens to be my friend and neighbor) because she has met and worked with Linda Sue and we both admire her work so much. If you want to know my reaction in real time, here is that text exchange. Mr. Schu, you should have asked me how many books I have in my apartment! We have… a lot. My two daughters are big readers, so half their room is made up of bookshelves and crammed with books. Then I have all my books, which takes up a lot of my bedroom and the living room, plus I get a lot of advance copies of books because I love recommending books as a contributing editor at Book Riot. There are piles of books everywhere! And if that’s not enough, we manage a Little Free Library right outside of our building in Harlem, and the kids in our neighborhood love it. My favorite used bookstore, The Book Cellar in New York City, donates overflow children’s books to our Little Free Library so we can keep it stocked for any kid who wants a book. We store all those donated books (boxes of them!) in our hallway. Did I mention our apartment is 750 square feet? But for me, being surrounded by books is a type of paradise. Don’t you think so? Yes, it is definitely a type of paradise! Look for The Vanderbeekers of 141st Street on October 3. October feels so far away! Can't wait to read this!